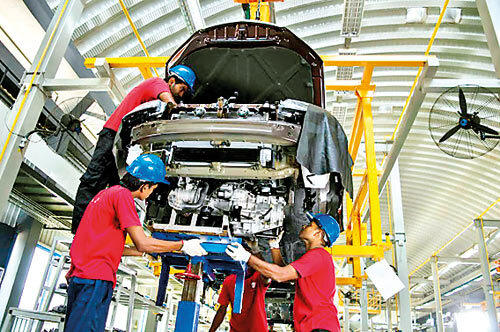 Forced into the slow lane by the government’s sudden tax hike, high interest rates and lowering the car leasing facility to 70 per cent from 100 per cent, Sri Lanka’s only maker of assembled cars, Micro Cars Ltd has cut down production almost by half this year compared to the production last year. Founder of Micro Cars Ltd and Chairman Micro Holdings (Pvt) Ltd, veteran automobile engineer Dr. Lawrence Perera who is also, the franchisee for Renault Trucks of France, told the Business Times that there was a significant drop in vehicle buyers in the first six months of this year. This was mainly due to the lowering of the vehicle lease facility to 70 per cent of the value of the vehicle being purchased. The balance 30 per cent has to be paid by the buyer of the vehicle, he added. Under this set up the company has cut down the Micro Car production to 170 units per month from 300 per month a few months ago, he revealed. “Previously, any vehicle could be purchased on a full lease basis even without a single cent in hand,” he said adding that middle class people who were planning to buy a small car like Micro panda or Maruti cannot afford it due to the sudden price hike. Their purchasing power is not sufficient even to fulfill their basic needs due to the country’s current high cost of living, he pointed out. Tighter regulation on vehicle loans will also impact affordability for buyers; he said adding that the vehicle assembly business is not so viable at present as it was driven towards an abyss by the present government. “Trying to save foreign exchange is only one aspect of this issue. Sales of cars have dropped by as much as 80 per cent as a result of the government using the maximum tax possible and this has put the idea of owning a vehicle completely out of reach to the average citizen”, he claimed. Today Micro has diversified into other industries with its subsidiaries Transmec Engineering Co (for Auto Engineering R&D, and vehicle after-sales provider having the largest AS Centre in Sri Lanka), Transmec International Co (a logistics provider also engaged in super floor luxury city bus operation, heavy haulage and rent a car service, etc), Micro Construction Co. (the Civil Engineering and Construction arm) and Euro Sports Auto Lanka (franchisee of Lamborghini and other luxury automobile brands). Micro Holdings employs more than 850 staff, empowering the Sri Lankan youth by exposing them to the latest technology in automobile and other engineering related fields, he disclosed.